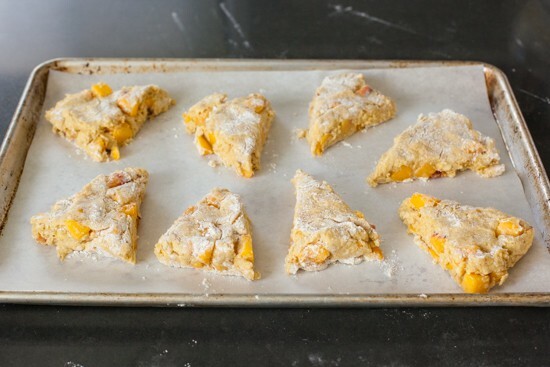 I first developed this delicious fresh peach, maple, and sour cream scone recipe three years ago with the intention of sharing it here. I made them a few times, tweaking the ingredients until they were just right. I baked them for my friends to make sure others liked them as much as I did. I even shared pictures of them on Instagram. The recipe was ready to go and I only needed to bake them one last time to take the photographs so that I could share them with you. Then, as has happened so often over the last few years, I crashed. I lost interest, I lost motivation, I even lost the actual recipe. Depression is a funny thing. Actually, it’s not funny at all, but it does play tricks on you. Depression sneaks in and starts taking things from you in a way that makes you blame yourself for losing them. It steals your motivation and interest in life and you feel ashamed and blame yourself for not being able to get things done. The louder that critical voice in your head becomes, the less you are able to do, and so the downward spiral continues. You hate yourself for being lazy, for being incompetent, for being a bad friend, for being a bad spouse, for being a complete and total waste. And when you’re feeling this way, when you’re so sure that everything is your fault and that you ruin everything you touch, it’s not easy to see that a big horrible trick is being played on you. It may not be easy for others to see it either. Sometimes you can hide depression from your friends and family long enough for it to really get ahold of you. Sometimes depression makes you so irritable and hard to be around that those closest to you are constantly put on the defensive, which makes it just as hard for them to see what’s happening. Depression isn’t easy to live with and sometimes it’s hard to live through. And if you’re lucky enough to figure out what’s really going on and get some help and take the steps necessary to pull yourself through it, you can eventually find yourself again. You’ll know that it’s the real you because you recognize yourself and your interests and your motivation and your enjoyment of life. And when that finally happens, the last thing you want to do is relive the whole thing by talking about it. Well, here I am talking about it. Because I’ve realized that the only way I can start working again (and it turns out that this is the work I want to be doing) is to talk about why I haven’t been working. And there’s so, so much to talk about. Since I last shared about my struggle with recurrent miscarriage, I had another one. Then I had an ectopic pregnancy which resulted in emergency surgery and the loss of a fallopian tube. I’ve struggled through bouts of depression with every miscarriage, but the worst was after the surgery. I eventually made it through, slowly and painfully, and when I once again found the real me on the other side, I tried to make peace with the fact that children might not be in my future. I started exploring new career options because even though I was feeling better, I had lost the desire to write about food. I considered finishing my master’s degree in education and once again entertained the idea of becoming a teacher. I took the CBEST so I could start substitute teaching and I spent some time in classrooms of friends who are teachers to help me decide if that’s what I really wanted to do. We got chickens. I found out that I was pregnant again. And that time, the sixth time, everything worked out. I had a very healthy pregnancy and we now have a beautiful, perfect, four-month-old daughter. We also have five chickens that give us delicious fresh eggs every day and keep us endlessly entertained. 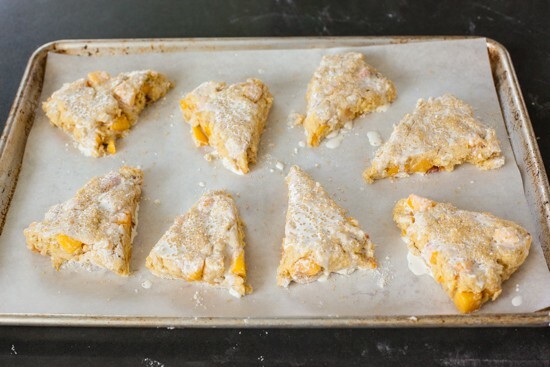 And I finally found that recipe for the peach, maple, and sour cream scones. I’ve known for a couple months now that I want to start food blogging again, but I wasn’t sure how to start writing here after so much has happened. It turns out that I can’t separate these life experiences from my writing about food and I don’t really want to separate them. Just know that you can always scroll down to bottom of the post to find the recipe if I’m spending too much time talking about real life. It won’t hurt my feelings and I’m even working on making my recipes easily printable… finally! For those of you who are interested, I will most likely be sharing more about my pregnancy and my daughter along with the new recipes. I occasionally share photos on Instagram and Facebook, so feel free to follow me there if you like pictures of chubby-cheeked babies, chickens, and sourdough bread. Now about that scone recipe. I did find the list of ingredients, although I never found the final recipe that had been tested. I experimented and made them a few times this last week and although it’s probably not exactly the same, Phil and I both agree that this version is very good. 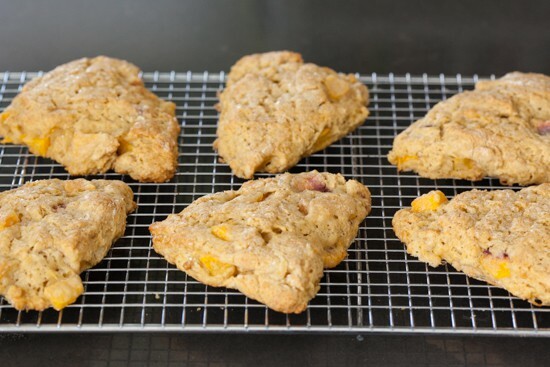 If you can still find decent fresh peaches in your neck of the woods, give these scones a try soon. If not, file the recipe away for next summer, because they are delicious. Scroll to the bottom of the page for a printable recipe. 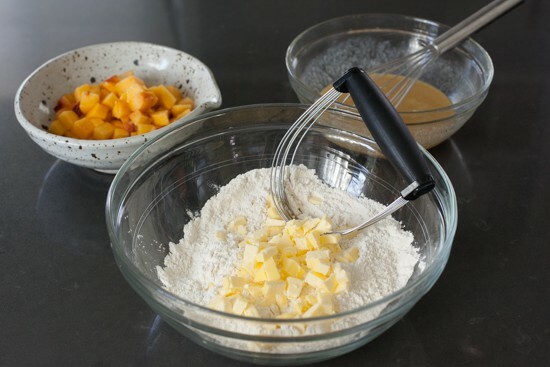 You will need all-purpose flour, baking powder, baking soda, salt, nutmeg (I like to grate my own, but this isn’t necessary), butter, pure maple syrup, sour cream, an egg, maple extract if you happen to have some, and a couple fresh peaches. 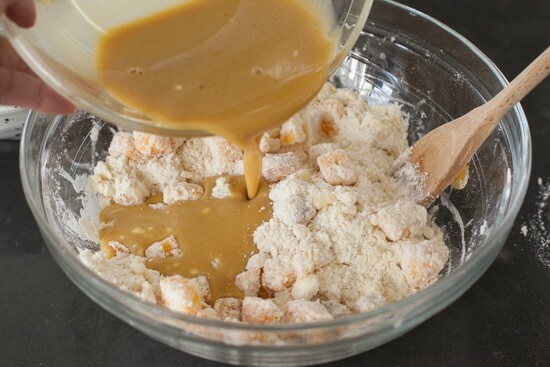 You will whisk all the dry ingredients together in a large bowl. Make sure to whisk it all together really well so that the baking powder and soda are well distributed. Another option would be to sift everything together a couple of times if you happen to enjoy doing that. Whisk together the wet ingredients in a separate bowl. Peel and chop the peaches. Cut the butter into small pieces. Make sure the butter stays refrigerated until right before you use it. If you chop the butter before you are ready to mix it into the flour, just pop it back in the fridge. 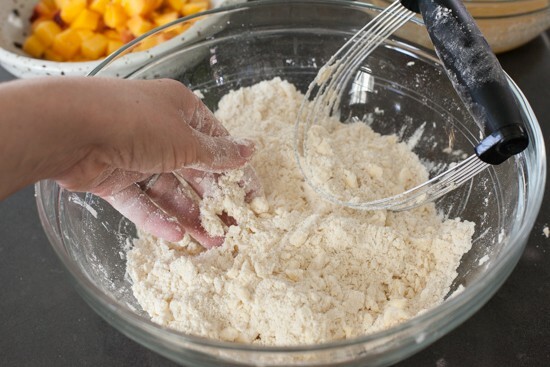 You’ll be adding the cold butter pieces to the flour mixture and cutting them in with a pastry blender or rubbing the butter into the flour with your fingertips. I like to use a combination of both methods. Cut the butter in until the mixture resembles coarse crumbs and the largest pieces of butter are no larger than the size of peas. 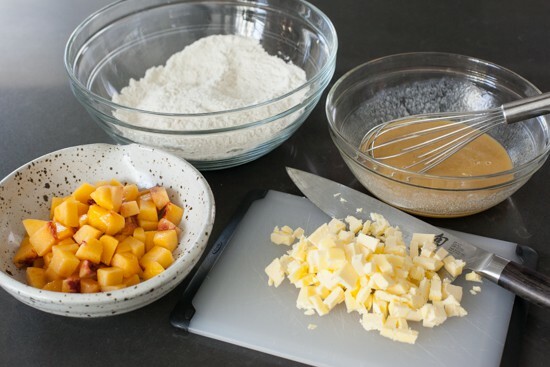 Add the peaches to the bowl and if any juice has accumulated, try to keep from adding it. 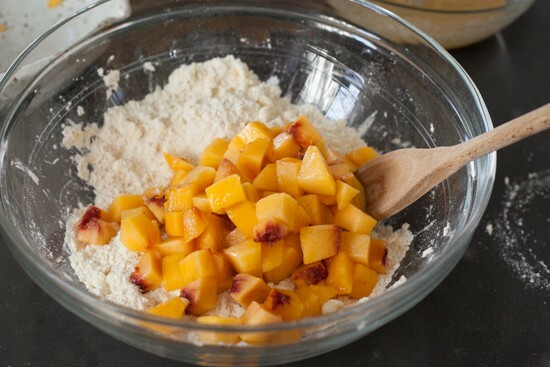 Toss the peaches with the flour mixture. Stir everything together just until all the flour gets mixed in. This is a wetter dough than most of my scone recipes so you will need to flour the counter well and sprinkle some flour on top of the dough to keep it from sticking to your hands. Scrape the dough out onto a well-floured counter and sprinkle a bit more flour on top. Gently pat the dough out into a circle that is about 3/4-inch thick. 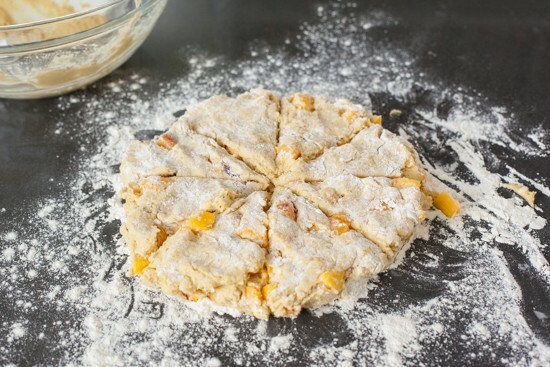 Use a long knife to cut the dough into eight pieces. You might need to dip the knife in flour if the dough is very sticky. Use a metal spatula to separate the pieces and transfer them to a baking sheet. I like to line my baking sheet with parchment paper for easy cleanup, but you could also use a silicone liner or nothing at all. At this point you could try freezing the scones if you’d like to have them prepped ahead of time and ready for the oven. 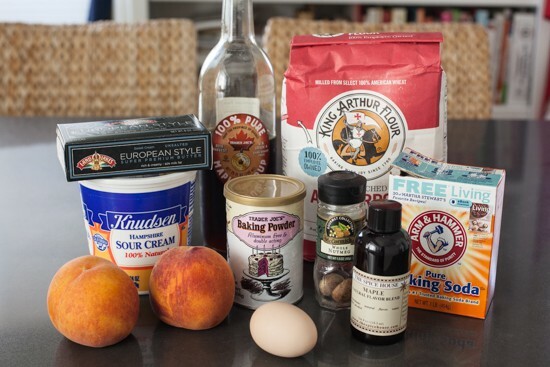 I have not tried this with this particular recipe and I’m not sure how it will affect the peaches. If you want to give it a try, freeze them right on the sheet tray and if you need to store them for longer than overnight transfer them to a freezer bag once they are frozen solid. If you try freezing them, please leave a comment letting us know how it worked! To finish the scones, brush the tops with heavy cream and sprinkle with crunchy sugar. I used raw sugar, but you could also use a decorative sparkling sugar. For an extra flavor boost, maple sugar would be delicious if that’s something you have in your pantry. And if you have none of those things, granulated sugar would be fine. If you are baking scones from the freezer, arrange them frozen on the baking sheet (no need to defrost) and brush them with the cream and sprinkle with sugar as if they were freshly made. Here they are, ready for the oven. I baked these at 400 degrees for about 20 minutes (add a few minutes to the baking time if baking from the freezer). They do spread a bit and aren’t the prettiest scones I make, but they are tender and delicious with a crunchy sugar top. The fresh peaches and nutmeg make you think of peach cobbler and there’s just a hint of maple that really ties all the flavors together. 2. 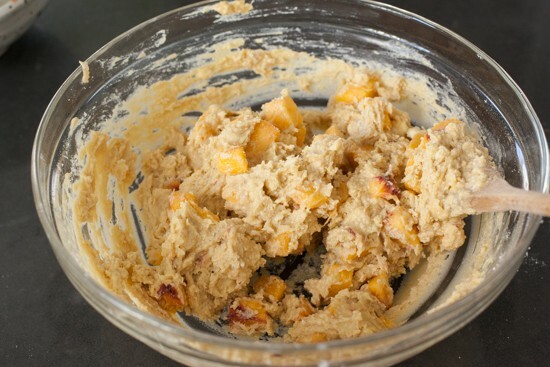 In a large bowl, whisk together the flour, salt, baking powder, baking soda, and nutmeg. 3. In a separate small bowl, whisk together sour cream, egg, maple syrup, and extract; set aside. 4. 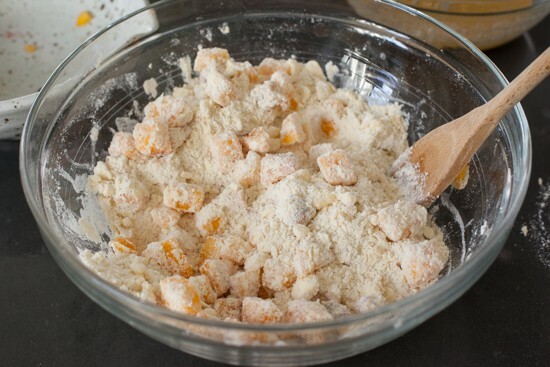 Dump the cold butter pieces into the flour mixture and rub them into the flour with your fingertips (or use a pastry blender) until it resembles coarse crumbs. Stir in the chopped fresh peaches. 5. Add the liquid mixture to the flour mixture all at once and stir briefly until the mixture comes together and all the flour is mixed in. 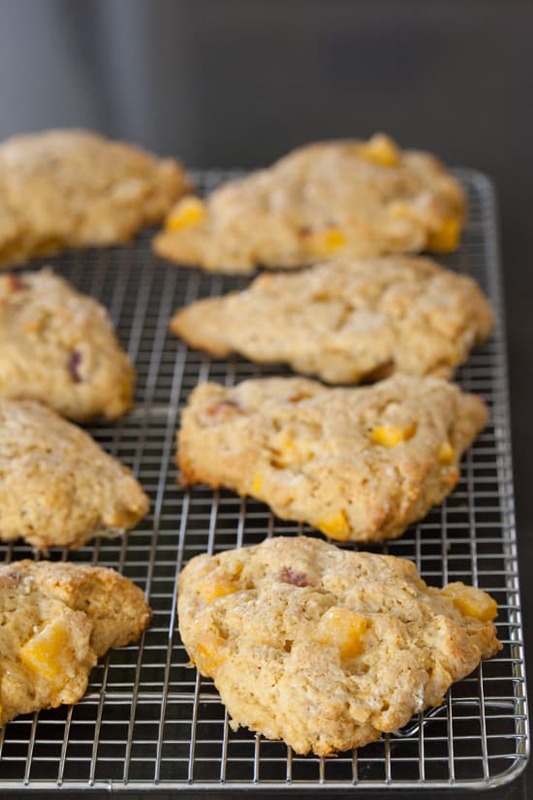 It will probably be wetter and stickier than a traditional scone dough, depending on how juicy your peaches were. 6. Scrape mixture out onto a well-floured countertop. 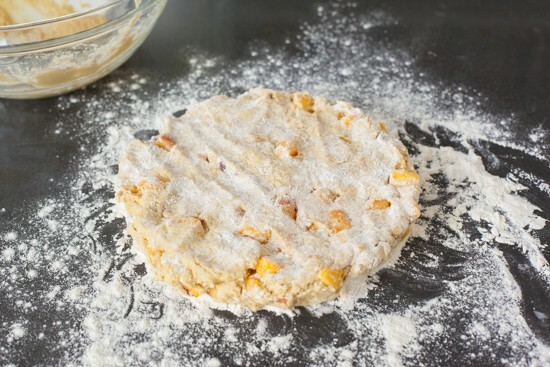 If it’s quite sticky, just sprinkle some extra flour on the counter and on top of the dough to keep it from sticking. Pat dough into a circle, about 3/4-inch thick. 6. Cut the circle like a pie into eight slices. 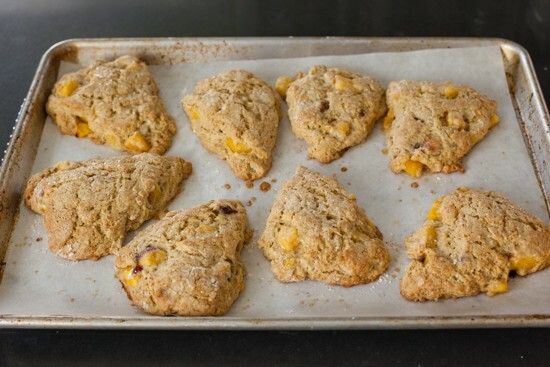 Use a metal spatula to carefully separate and move scones to a parchment-lined baking sheet. 7. 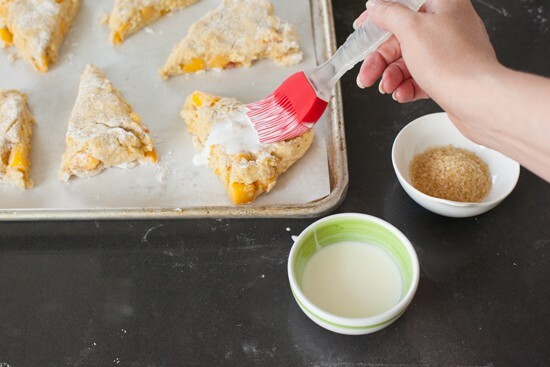 Brush scones with heavy cream and sprinkle evenly with turbinado sugar. 8. Bake in a preheated 400-degree oven for about 20 minutes or until lightly browned. Remove to a cooling rack and let cool for about 10 minutes. Scones are best eaten slightly warm, although they will be delicious for several hours after baking. *I used kosher salt for this recipe but if you'd prefer to use table salt, reduce the amount to 1/4 teaspoon. Thank you for sharing! These scones look awesome, I'll need to bake them soon! Thank you for sharing your story. I'm so sorry you have been struggling with so much. It's so great to see you back here. Congratulations on that sweet baby!! Thanks for sharing and I'm glad you are back! It is so wonderful to see you back. I love that you're sharing again, and what you're sharing. There's something magical about maple and fruit together. I'm going to put this in my pocket for Texas peach season. So happy to see you back and I love your honesty and transparency. Thank you for contributing to the breakdown of the isolation and secrecy surrounding pregnancy loss and depression. I'm so glad you have your beautiful, healthy baby girl now. I also know that doesn't erase the pain of the previous struggles. Sending you big hugs and drooling over your scones! We have truly missed you and so glad you are back! Congratulations on your precious baby! Give her a sweet kiss for me! BTW, these scones look fabulous! Congratulations on your baby girl, Nicole. And thank you for sharing your story. Depression is a tough thing but as we know with all mental health things, you help others so much by sharing. Glad you're back with your delicious recipes. So glad you are back. So pleased that you have a precious baby girl. Best wishes to you and your family. Congratulations! Glad you're back. I'm not much for a baker anymore, but these are quite tempting! I've been following you for many many years but never felt an itch to comment. Thank you for sharing. Made me tear up. Miscarriage and depression are hard hills on the path. Even harder together. I am so glad that you are in a better place. Bless you and that baby. ??? Much love your way Nicole…I am so happy to see each and every picture of your beautiful daughter. So incredibly happy for Phil and you. Depression is a MFer for sure…I've been fighting it off and on over the past year and a half myself. But seeing each of your smiles have helped me keep that fog at bay. I'm glad you are back blogging and can't wait to see what comes next. Who know's maybe I'll even get back to the BBA Challenge we embarked on so many years ago. I'm so glad you are back, friend. Everything you've been through is worthy of taking a break for sure... I'm so sorry. But I'm glad you have found the strength to keep getting better, hopefully one blog post at a time! Welcome back. I am glad you are back and feel better. Life is not easy..but surviving and coming out on top is great. I love scones and your new recipe. Thanks for sharing. Welcome back and congratulations!You've been a favorite blogger of mine for a couple years, I've missed you and your lovely yummies!Looking forward to your new food projects and experiences with your little squish! Glad to see you back, and thank you for sharing your journey, which resonated with me. I look forward to trying this when peaches are back in season for me. How marvellous to know that you have worked through the depressions and have come out the other side with a precious baby, thank you for sharing your story. It is so good to see you back with us. Stay smiley! Hi Nicole, Congratulations on your beautiful daughter! I'm sorry that it has been such a hard few years for you. Those are really tough things to go through. It is wonderful to have you back in this space again. Great to see you back on-line Nicole! When Rita and I started our blog in 2010, Pinch My Salt was one of our model sites. You were very brave to share your story, not an easy journey but I hope you continue to find satisfaction in sharing on your blog. I think food, family and baby will be a beautiful change to your blog. All the best!